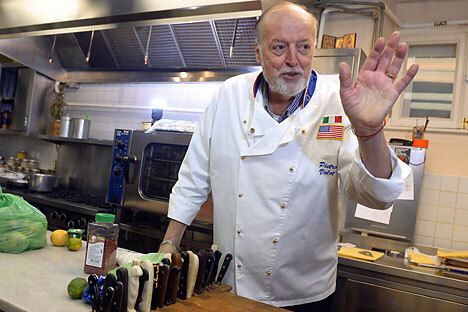 The head chef of the U.S. ambassador’s residence in Russia, Pietro Valota, an Italian, talks about how the mission’s kitchens are coping with the Russian embargo on EU food imports and shares his experience of cooking for ambassadors and presidents in 40 years of working at the embassy in Moscow. “Well, off we go, to the battlefield,” sighs Pietro Valota as we step out into the guarded courtyard of Spaso House, the residence of the American ambassador in Moscow, in order to make it to Moscow’s main market, Dorogomilovsky, by nine. Valota is holding a shopping list with some 40 entries on it, scrawled in a mixture of Russian and Italian. Once at the market, Valota is in his element. Knowing people makes logistics easier. At some stalls, produce for “uncle Petya” has been prepared in advance; for cheeses we place an order and come back to pick them up some 20 minutes later. Deep inside the market it is possible to find anything, be it mozzarella or gorgonzola. “The president has banned cheese [imported from the EU, in response to Western sanctions imposed against Russia over its role in the Ukraine crisis – RBTH], but here it is,” says Valota. The son of a miner and a housewife, having spent his early childhood with three sisters and two brothers in a small town in northern Italy, Valota first found himself working in a kitchen at the age of 14, before he even finished school. He came to Moscow when he was 28. On the whole, Valota has got used to living in modern Russia, though he sometimes feels a little nostalgia for his younger years in the USSR. One of the responsibilities of the head chef is to remember and accommodate the gastronomical preferences of the ambassadors he serves. Valota is now on his 13th head of mission, John Tefft. When he started, the ambassador was Walter J. Stoessel (1974-1976). “Cuisine that is in fashion now is more about show than about real food,” says Valota. “Take nouvelle cuisine for example: a large plate, a single prawn lying on top of a sardine and some decoration. And that’s your meal. It is ridiculous! You come home hungry and you end up eating sandwiches! Receptions, big and small, are part of his everyday routine. A recent menu for six people included a warm salad with prawns, veal scaloppini with mushroom sauce with asparagus, carrots and tagliolini on the side and ice cream to finish with. All that was cooked by Valota and his assistant. Two days later they had to prepare a reception for 200 people, with 10 courses on the menu, as well as drinks, cheeses, crackers and nibbles and three desserts. Making sensible economies is another daily concern on the head chef’s mind. In his 40 years of working for U.S. ambassadors, Valota has been to America only once: ahead of President Reagan’s official visit to the USSR. The Americans wanted to bring their own cooks, but the Spaso House administration would have nothing of it. So Pietro was sent to the U.S. for two weeks, for an “exhibition show” of sorts. In the end, Valota was entrusted with cooking a dinner for Reagan in Moscow. However, U.S. secret service personnel had removed everything from the kitchen, including salt, and brought everything from the U.S., and one of them tasted the food before it was served. “Only if in his previous service he happened to visit one of the places where I worked and I knew nothing about it,” replies Valota. This is an abridged version of an article first published in Russian in Ogonyok magazine.